Think you can't get a great workout in 30 minutes flat? Try this tough set...I'm getting ready to do it myself! Complete each exercise for one minute with the heaviest weight manageable without sacrificing good form. *Remember to drink about two cups (16 oz) of water and hour or two before exercise *Drink ½ cup (4 oz or about 2-3 gulps) every 15-20 minutes during exercise. *Be sure to continue drinking water even after your workout is complete to ensure that you are properly hydrated. Remember to listen to your body when exercising in the heat. If you start to get dizzy, light headed or if you stop sweating when you’re working hard, it’s time to quit for the time being and drink some water. So little time, such a great workout! One of my early clients slept through her alarm, so while waiting for her, I'm taking fill advantage of the gym...tricep pressdowns, leg extensions, hip ups, chest fly with leg lowers are all jump-starting my body today! Use the time you have to make you better! Veggie omelet with under 100 calories? Yes please! I love eggs and veggies, so combining them just makes sense! 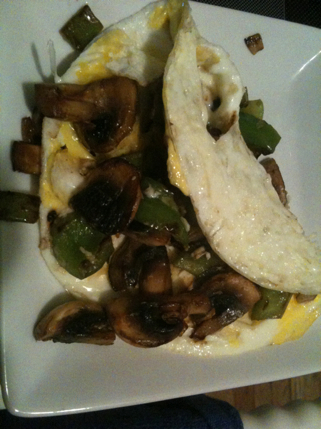 I use 3 egg whites, 3 large mushrooms, as much onion as I feel like and a quarter of a green pepper...under 100 calories, a full serving and sometimes more of veggies and 11 grams of protein. Enjoy! New exercise play list...there is something for everyone! Here is my new favorite 50-minute workout play list...it includes a bit of something for everyone, from Gleeks to the hip hop obsessed to old school hits lovers. Enjoy! If you've never heard of quinoa, you are in for a treat today! It is a grain that is chock full of fiber and complete protein (protein that contains all 9 essential amino acids). It's also totally delicious and filling to boot! Here's a super easy recipe to make your quinoa taste fantastic (I use it for a meal with veggies on the side or a perfect side to chicken or fish). *after the quinoa has toasted, add broth and bring to boil, cover and reduce heat. Let sit for 15 minutes or until broth has been absorbed. 4th of July BANGING workout! I just finished a super hard, super fast strength and cardio combo...check it out and burn some calories before BBQs and fireworks start tonight!